Where would art be without the never-ending argument between imagination and reality? All art necessitates a leap of the imagination. All art, whether naturalistic or not, makes its own reality. And rarely has this argument between imagination and reality been pursued with more intricacy and subtlety than in the later paintings of Édouard Vuillard, which fill a room near the end of a small retrospective that has just opened at the Jewish Museum in New York. There are many reasons to go to this elegantly arranged show, which traces the arc of Vuillard’s career through his involvement with a group of wealthy Parisians who were collectors, connoisseurs, and arbiters of the arts—and who also happened, at least many of them, to be Jews. While the exhibition, organized by Stephen Brown of the Jewish Museum, invites a number of interpretations, for me it is the late paintings that hold the greatest fascination. Here naturalism itself becomes an imaginative act, a way of dreaming about the world. Of course the canvases of Vuillard’s that are easiest to love date from much earlier, from the 1890s, when he was turning people and places into densely patterned, puzzle-like arabesques. In these works, done when Vuillard was in his late twenties and early thirties, the imagination is triumphant, with the particulars of the fin-de-siècle interiors giving way to poetic near-abstractions. Some of these paintings are masterworks, no question about it. And as I see it, their questing spirit flows directly into works Vuillard did later—beginning around 1910 and all the way up to his death in 1940—in which he insisted that the prose of reality had its own kind of appeal. In paintings of Madame Louis Kapferer, Marcelle Aron, and Madame Jean Bloch and her children, Vuillard pushed his old fascination with people and the places where they live into a new kind of argument between imagination and reality. There are details in these paintings so overbearing—a mantelpiece heaped with knickknacks, a patterned fabric on a sofa, a wall with a mirror surrounded by trompe-l’oeil trellis work—that they may at first seem to threaten the painting’s coherence. Is Vuillard’s hunger for representational truth at war with his hunger for pictorial truth? I would argue that he is sometimes playing devil’s advocate when he became immersed in these naturalistic forays. He pushes us to the brink of a reality that confounds the painting as an act of the imagination. And then—just in the nick of time—he offers us a shocking contradiction, such as Marcelle Aron’s nearly abstract hand, or the richly textured, unabashedly painterly surfaces of the portraits of Madame Kapferer and Madame Bloch and her children. Vuillard is showing the academic realists that he can beat them at their own game. And only when he’s on the verge of winning does he allow the avant-garde imagination of his youth to reassert its power. Go to the Jewish Museum and linger over some of the supremely strange paintings that Vuillard did in his later years. 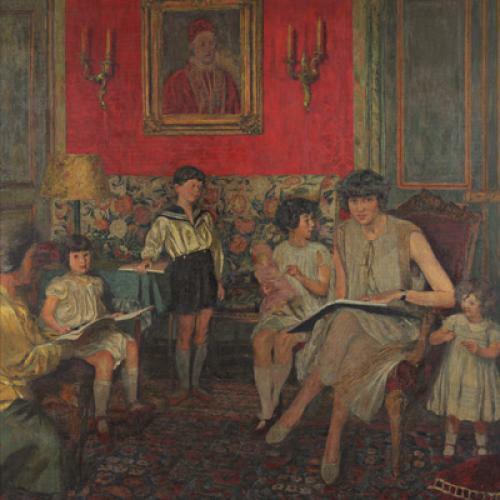 Look at the portrait of Madame Bloch and her children. You will probably begin by feeling that the composition is immobilized by all the nitpicking details. I certainly did. But the longer I studied this astonishingly elaborate canvas, the more I was convinced that Vuillard was using his finicky technique to carry us into a dream world where each individual is dreaming a different dream. The verisimilitude suggests a heightening of consciousness, the magnified sensations of childhood. Another wonderfully confounding creation is the portrait of Marcel Kapferer. Vuillard has painted the head of his friend, a distinguished collector, with an attention to detail so obsessive as to risk academic banality. Could Marcel Kapferer’s elegant face be an allegory of the old-fashioned search for truth, the search that the fin-de-siècle dreamers of Vuillard’s younger years had dismissed? And could Vuillard’s decision to surround this dispassionate mask with a play of shifting planes—a folding screen, two open portfolios, pictures on the wall—suggest a game of shattered illusions that Nabokov or Borges would admire? Is Vuillard telling us that the truth he has so carefully constructed can be knocked apart as easily as a house of cards? I’m not sure. I am sure Vuillard never forgot that he had once taken art to the brink of abstraction. In his late work he is still on the brink—of another unknown.